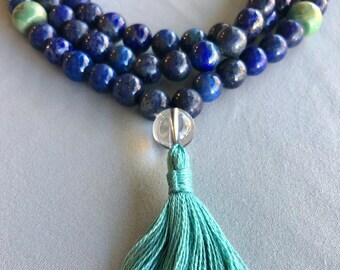 These chunky, natural turquoise beads with matrix of brown grabbed me at a gem and bead show and gently demanded I take them home and let them play with my lapis. I submitted and here is the result! Guru/focal bead collection! People ask for mala customizations. 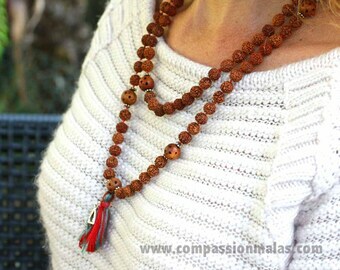 I have these artsy beads that can replace the guru beads on any full length mala I make. They'd look great with rudraksha seeds. Convo if you'd like to add one. These are the new bronze lotus and Tibetan Hung syllable charms that I hand carved in wax and had cast in bronze and silver. They're my own designs and I'm happy they're here! This is me cutting the wax for the Baby Lotus (Opening Lotus) charm. Then I carved it and smoothed it. Then my caster cast it for me in a small batch. The Baby Lotus symbolizes us opening a little at a time to joy and wisdom. A photo of the shrine room at Lerab Ling retreat center in the South of France. The teachings of Buddha never cease to inspire me and my work. It's all about inner peace!